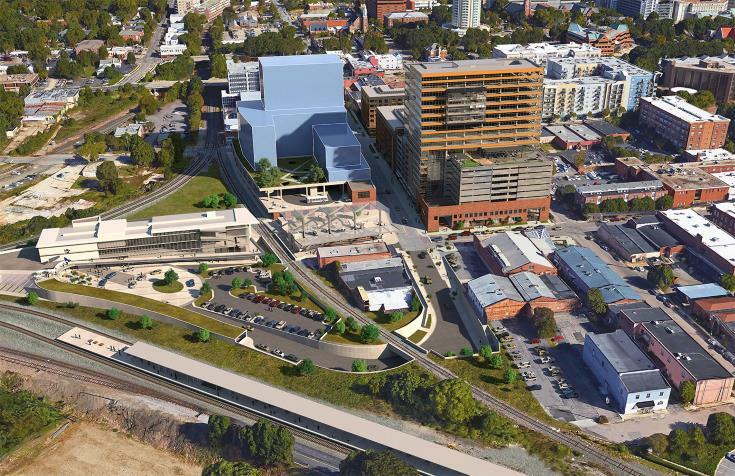 With a ribbon cutting date set (April 30 at 9:30 am by the way) for Raleigh Union Station, it is never too early to take a look at a new project nearby. For years, plans have been light about integrating buses near Union Station that there hasn’t been much to post about. 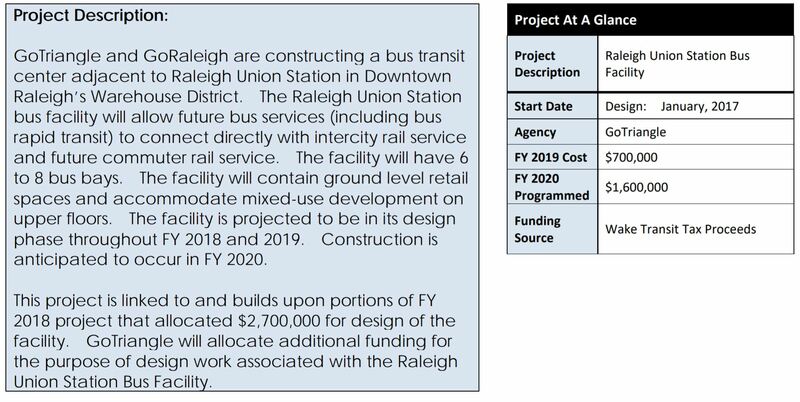 However, within Wake Transit’s Fiscal Year 2019 Draft Plan, details arise about the bus facility planned next to our newest train station. A hat tip to a long-time reader for pointing me to the rendering above, showing what such a bus station could look like. Funded by the half-cent sales tax passed in 2016, FY2019 will allocate $700K towards design of this facility. This is in addition to $2.7 million for FY2018. Located across the street from The Dillon and pretty much the only adjacent property to Union Station, I think it should not be a surprise that this building is set up for some major changes in the coming years. The rendering, which readers should take with a grain of salt and is nothing close to final, suggests what a mixed-use bus facility could look like. Future site of the Raleigh Union Station Bus Facility. Hargett Street, April 2018. The Triangle Transit Authority already owns the buildings. With a zoning of DX-12, (Downtown Mixed use, 12-story height limit) I imagine a public-private partnership is in order to put some office, for example, over transit in this area. I’d like to think too that The Dillon and nearby Citrix have also paved the way for how warehouse development can happen in the Warehouse District. There’s no reason this facility could not attempt to keep some of the character that exists here. Raleigh Union Station civic plaza adjacent to future bus facility. West Street, April 2018. This area will truly be our city’s transit epicenter and as the Wake Transit plan comes together through 2027, I see nothing but increased pedestrian counts here. Coupled with all the changes coming to West Street (here and here) overall and how planners working on Dix Park want to connect downtown, these are all huge moving pieces that could really click in the future to make a great western side of downtown Raleigh. I think you hit all the nails. I like the massing (at least in terms of scale) of this building, and definitely hope they maintain as much of the existing warehouses as they can (as you said, like Dillon and Citrix). Having the BRT hub here will create a pedestrian rush hour, especially if the BRT actually prompts development along its route. That is going to make the warehouse district crowded, in a good way. Mix that with the eventual Kane project, and in a time spand of 5-7 years the warehouse district will have gone from kind of dead to one of the better parts of the city. Looking at the picture, they haven’t accounted for 1 or 2 Glenwood locations. Picturing them included in the rendering really brings density into this area in a short period of time. The west side of DT is going to be transformed over the next couple of years in a way that I think it’s difficult for most people to actually wrap their heads around. With the new office buildings, the food hall, hotels, residential and especially the Peace project in conjunction with the bridge replacement @Capital + the renaissance of Devereux Meadows park are going to completely transform the area. This list only includes things that are actually happening now. If one adds the bus station, 300 & 400 Hillsborough projects, and other envisioned projects, the experience difference is going to be spectacular. So what of rail road crossings on Hargett St? They’ll eventually service many trains in the coming decades. I don’t see trains and buses playing nice. Is that road being redesigned? Sunk or raised? I wouldn’t be surprised if the Hargett Street rail crossing is closed to through traffic. It has been mentioned during the Southeast High-speed Rail talks awhile ago so really if that project ever happens, I see this crossing closing. Great oppurtunity for a bike/ped bridge though, IMO. A pedestrian bridge would be great and should be part of any negotiation to close that stretch of Hargett. Closing Hargett would really have an impact on the neighbors to the west of it and to the new hotel. 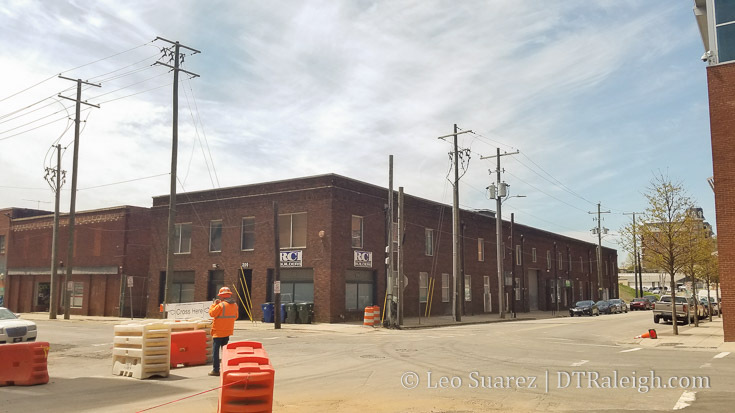 Doing so without pedestrian access would somewhat isolate the hotel from the Warehouse District and focus its relationship with Glenwood South. As it stands, I don’t think that one can discount the importance of hotel guests to take an elevator down to the garage level and exit by foot right into the Warehouse district on Hargett. That hotel property is one of the connector sites between two districts and I think that it’s really important to get it right! I’m excited for the transformation of this area too. However, when I see bus station, all I can think of is the current one by Moore Square and Wilmington St. Hopefully they will do something to keep it from being taken over by the transients and drug addicts that currently ruin both end of the bus station. It would be great if regular people would actually feel safe using the busses and associated facilities. Unrelated, but are they really not putting a roof on that entrance to Union Station? What is that big set of metal beams supposed to do, other than provide a place for birds to sit and poop on the visitors below? The portico area is going to be used by Barcelona as an outdoor dining area with it’s own steel trellis but no roof is planned. Those beams you are seeing now are actually pieces of the crane system that was in the Dillon warehouse. All aesthetic. Andrew, Your confusing the entrance of the Dillon and Union Station. I hope 5-star finds another warehouse to occupy after that building is gutted for the bus station. I love that place..
Maybe I’m anti density but I think the golden years for the warehouse district are going to be 2018 – 2020 before it becomes the official transit center of the city, but after the restaurants and shops open at the Dillon/Morgan food hall. Being on the Fringe of DT and enveloped by railroad tracks I don’t see a highly dense area there as a very effective use. Couple that with the unreleased plans for the dram and draught corner of Hillsborough which was bought by one Glenwood developers and that whole area becomes a clusterf*ck. Goodbye leisure strolls/drives across Boylan bridge, and poor Boylan heights – that’s going to become a freeway of transit between Dix park and warehouse/Glenwood. I also hope 5 Star finds a new location. I definitely don’t agree with the rest of your post, though. The Warehouse District isn’t on the “Fringe of Downtown” first of all. It feels that way sometimes because of the dead zones between there and Fayetteville St, but those will fill in rapidly. It’s firmly inside downtown by any definition. I also don’t see why Boylan Heights would see a lot of transit. My assumption is that the station entrance will be on Hargett St. All four outbound bus lines will run east, with the Capital Blvd bus splitting off at McDowell, the Western and Wilmington St buses splitting off at Salisbury, though I’m not sure about the New Bern. I’m assuming of course that this transit center will be the terminus for all four buses. The line from Union to Dix would be Hargett>Salisbury>Western for outbound, probably with a pedestrian bridge over Western at some point at the “Dix Park” stop. Looks a lot like they plan for a West St tunnel there, doesn’t it??? Honestly, people need to get over it. There’s a rough element at Moore Square, but nothing compared to most major cities, and the station is staffed with security at almost all hours. Steve, It’s on a physical fringe. The RR right of ways aren’t going anywhere and the whole Boylan corridor is boxed in with historic properties and chasms of railroad tracks. In this respect it is the edge of developable DT and it transitions rather quickly to historic residential and a prison. West St. needs to reconnect under the tracks. There’s simply no other good answer to a N/S corridor to connect the entire west side of downtown in the middle of the action. Boylan Ave is too far west and Glenwood dead ends @Morgan. Without the West St. connection, the West South Street area will become more isolated as it develops except for the foot traffic that can connect more directly north through The Depot property. I’m sure that people will try to cut through The Depot with their cars but I suspect that that won’t be tolerated. Don’t they already control car access on busy evenings? I feel the bus station is only going to negatively affect the Warehouse District. Those builds should be redeveloped into something awesome and keep the structure. Buses have the stigma of being for the homeless and poor and aren’t bring the clientele businesses want or need. Don’t we already have a bus station? If I am correct, we paid 10 million dollars for it to be renovated. I know what you’re saying, but if the city is trying to get a lot more people to use the buses, they’ve got to do something. There’s also a reason most of the businesses around Moore Square and S. Wilmington St. aren’t exactly thriving. It’s a perception thing. there’s gonna be another bus transit site besides the one at martin st? is this city buses? regional? what ? I remember in Boston the boom of building along the train lines. It would have neighborhoods on both sides. Eventually they joined them by constructing buildings over the tracks. Now when I go there I cross over through different shopping centers and honestly don’t realiaze I am above a train line. @Jeff, excuse the world but some people don’t enjoy being hit up several times for money and to look around and see people smoking and shooting dope while waiting for a bus with a child. Would you GET USED to it if they all came over to your place and stayed. I did not see that in the design plans when I voted for transit improvements. Maybe I missed that in the rendering. It’s not ok just because there are more problems in other cities. Don’t bring the Greyhound to Downtown leave that mess where it’s at. It was nothing but a headache for the people and the surrounding business when it was next to the Quarum condos that burned down. @Al – So what do you propose we do with all the poor people that need to use the bus? Clearly you haven’t spent any significant time in bigger cities. If you want an antiseptic environment to shelter your child from the realities of life – move to Morrisville. Besides, Raleigh is Pleasantville compared to most cities. I see what you’re saying. I think the “fringe” feel will probably only last a little while, to be honest. Hillsborough St will eventually be a long line of mid-rises (5-10 stories, taller on the south side obviously) from the 440 interchange to the state capitol. The “Old Saunders” area just across Western from the Warehouse District will be filled with midrises along Lake Wheeler, and Kane’s Mixed-Use along with the eventual redevelopment of Heritage Park will extend the “downtown” element of the WD south to meet it. That being said, Boylan Heights will always run right up to downtown, but it’s hardly unusual for that transition. I’m confident that once we get a few 6-700 foot buildings, and I’m very confident that day will come, 10-20 stories won’t feel as imposing by comparison. Hey all. I’m deleting any more posts about the perceived unpleasantness of other humans of different means and backgrounds around you in our city. Since I support an inclusive downtown, no need for that on this blog as well. Thanks, Leo. I support inclusion also. Very well said. I’m confused now. I think Al responded with an opinion that agrees with mine, but seems to be arguing with me. And for the record I’m not talking about poor people or not including people. I’m talking about how the perception of unsafety impacts participation by the vast majority of residents. Spending millions to overhaul parks and transit facilities is something I support, but I hate to see it wasted if these improvements don’t bring the increased users everyone is hoping for just because we allow a handful of people to do whatever they want. It doesn’t have to be against the homeless. If dozens of drunk frat boys took over Moore Square no one would want to use it either. As I understand the current approach, the buses would be split between Union and Moore Sq with each serving half the City or so. I imagine there would need to be a connector shuttle of some sort. RE 5 Star, that building should be saved and the one immediately attached to it. Everything else can be scrapped or redone drastically. That is a great photo at top of page. Anyone know when 400H breaks ground? John532, for sure. The West st. tunnel will be critical to connect those areas and to relieve traffic from abusing Boylan street bridge as these projects actually come online. We will see really soon how that area stands up to increased traffic, as hundreds of tenants of The Dillon, residential and commercial, move in. impressive and of great quality!! The DT Element will not expand into single family, historic neighborhoods. It’s just not going to happen ever. To that end, the warehouse district does represent an edge of downtown relative to its position adjacent to Boylan Heights on the SW corner. However, on the Warehouse District’s NW corner is the Hillsborough Street corridor that offers opportunity for densification. With the introduction of train tracks coming and going from 3 different places in the district, it just adds another layer of complexity. Opportunities for growth exist where we have underperforming (from a density perspective) in both rental housing and in commercial space. Unfortunately, a lot of that opportunity exists in the realm of those things that give Raleigh charm. A lot of small interesting buildings are on sites where the opportunity exists. This would include icons in the city like the MidCentury Char-Grill, Krispy Kreme, the charming row of turn-of-the-century office buildings along Wilmington Street, etc. WWII era multi-family including Cameron Court and Boylan Apartments are another opportunity for densification along Hillsborough St. The question for the city is what are we willing to lose in order to get more density? Being the state capital also further complicates issues for Raleigh with State owned surface parking lots smack dab in the middle of the city taking up land that’s so valuable that it hurts, and many small state buildings that have long since worn out their welcome and purpose. This is why the overall proposal for the soccer stadium excited me; it intended to work with the state to consolidate and update buildings and workplaces that freed up land. I think it would be really interesting to get some groups together that care about DT to charrette places that matter to us and places that the city should encourage development in line with its vision to the future. I lived in NY and most people that travel the mass transit are are hard working and influential. However we all know the problems that bus terminals and other mass transit stations have. What I want to know what is the Raleigh Police department is going to do with the problems that this will bring to the residential area. And who ever said that only poor and homeless ride the bus obviously never lived in a big city. The Quorum Condos did not burn down. It held up very nicely to the fire. There was extensive water damage from the outstanding firemen saving the building as well as heat and smoke on the side of the fire. I know you didn’t mean to say “burned down” but thought I should correct that quickly. I think the transit system will be increasingly used by everybody as long as it is more convenient and cost effective than driving. As a Quorum resident the bus is quite convenient to most places. I’m still optimistic about the commuter rail along-side the existing tracks although it seems we hear less and less about that and more about the buses. The one thing that is directly in the crosshairs between downtown and Dix is Heritage Park. Leo, I know you’ve talked about it before on here. That’s really the missing link between the two activity centers, and I hope whatever happens there is great for the civic realm while still being inclusive of those living there right now. I’d love to see Central Prison get the wrecking ball instead, but prisons usually don’t just pick up and move so easily. Plus, the cost of that land is likely astronomical. @ Stan, I did not say anything about poor people riding the bus. Everyone deserves to ride the bus. All I was saying is anyone that sits in that station. Me included should not have to be subject to drug use in pucbkic and being bothered constantly for money. Illegal activity is what it is regardless of who you are. I am sympathetic to anyone’s plight. Not knocking anyone. It has an impact on the city, it’s not going magically unnoticed and has to be addressed sooner or later. It has little to do with development companies as far as wanting to build. It’s a quality of life thing that can start to impact who says and leaves the city and how safe they feel and if they want to raise a family downtown. Please know that we all go through things and find hard times. Everyone takes it as a given that downtown is the only place than can or should be dense and that the suburbs will always every be a directionless tangle. I propose ripping out entire, aging subdivisions, and replace them with square grids, mixed use blocks and buildings, proper building orientation etc. Good, existing, things downtown should not suffer just because everything outside of downtown was built terribly. Contrary, those things built terribly should be the first areas to suffer. Alexandria VA is an example of a place that has almost it’s entire historic core intact, and a new modern grid expanding off of that where all the modern office buildings and hotels are. Nobody, was all like, we gotta tear down King St for this here 10 story office building!. They just built out another block, and built it there, and left the 200 year old row houses as they were. I find it strange that while cars need more streets than horses and wagons did, we build areas with fewer available avenues to actually drive from place to place on. And I’m not buying “well this is where we are now”. Suburban style development is killing everything good either directly or indirectly, by forcing overwriting/densification of many a downtown’s character laden areas. Heritage Park is zoned RX-3. @ Mark: North Hills is going to be extremely dense, and one day might connect to DT Raleigh through Kane’s proposed “Amazon Corridor.” The idea that density need only be downtown is foolish. The reality is, looking at Kane’s projects, we can trace a line on a map looking exactly where future density will go. I believe in the next 5 years we will see Kane’s group start buying up properties along Capital Blvd heading North to North Hills. There is a lot of room for expansion there. @ Robert, you nailed it on Kane, it’s in the works already. Re: Hargett crossing closure, how cool would it be to have our own version of NY’s High Line (bikes and pedestrians) over the wye? 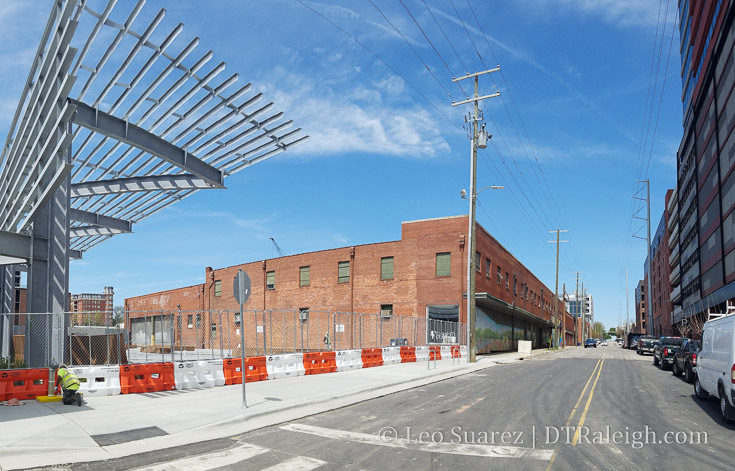 I’m envisioning a T-shaped elevated structure that starts at the southern terminus of Glenwood, incorporates itself with an entrance to the new 2 Glenwood hotel, flies south over the tracks and T-bones into an east/west Hargett St. High Line. This would span the gap from Boylan St. Brewpub over to Five Star or all the way to West St.
Will, I love that! From Glenwood, it could seemlessly integrate from on-street to off-street with ramps and could go parallel to the train tracks. It could then also continue right into Union Station, either to the buses or the trains. Either way, a complicated kind of elevated walk/bikeway would just look great! The LGBT Center is already being forced out of their location by the end of the year and I’ve heard of other businesses & organizations are getting nervous too. Now we’re gonna put Five Star on this list as well? I’m all for growth but this is one corner of downtown that I think has been injected with steroids and nobody is taking the time to make sure it doesn’t end up going too far too fast. Fortunately you don’t own the city so you can’t really just press the stop button. This growth is just going to continue. Better buckle up! I’m genuinely curious, what do you mean by “too far”? Robert B, sure North Hills already is super dense. It has immense traffic problems (no street grid to speak of) and limited transit so doesn’t meet my idea of urban-in-suburbia. I think a High Line style overpass would have been better in the spot of the old Martin St viaduct so you’d get a nice long path to amble around on. On one block of Hargett and one block to Morgan, I think simple up and over (like I linked to) makes more sense. @Leo we could call it THE WYE LINE!! Haha!!! It would be a really cool connector of Glenwood South and Warehouse District. As it’s currently configured, there’s no connection between the two districts at all. Morgan St., the new hotel, and the tracks basically create a giant wall. @RaleighRob, the Hargett St. crossing might be a casualty of increased future rail traffic, as Leo mentioned earlier. So, this would be a way to preserve connectivity of neighborhoods in the face of transit growth. I’m definitely looking for a decent increase in density in the warehouse district due to its proximity to union station. I realize rents will go up and established businesses may have to move but I’m hoping that increased pedestrian traffic and more supply of rentable space will help businesses there as well as the new ones that come in. A dense retail cluster will really help make it a destination. From what I’ve seen the SEHSR project is decades out so if this is the one factor that will close Hargett Street, we’ve got time. I expect to be dead before SEHSR makes it to reality. As for subsidized housing, I agree with Leo here, but I will say that I will fight any further subsidized housing projects in downtown that are proposed with a suburban site plan. That eats up way too much land, and DT doesn’t have that sort of room to waste. In general, I don’t want ANY suburban model development in DT to occur going forward, and I wish I could take back some recently completed examples. Would this be a BRT bus station? Doesn’t seem that it would be feasible to have a dedicated lane in and out of this location unless they close one of the streets off to public transit traffic only. Mark – Union Station incorporates an exterior bike/ped walkway on the south elevation that follows the path of the old Martin Street Viaduct. It currently terminates at an observation deck overlooking the tracks that is designed to be the jumping off point for a future ped/bike bridge to continue over the tracks to tie into Boylan Bridge. Similarly, the sloping green roof of the concourse is designed to be able to convert to a ped/bike walkway to a stair under the RR bridge at West Street to connect to the future West Street tunnel. Regarding the Southeast High Speed Rail, environmental impact studies have been completed and approved for the Raleigh to Richmond segment. Capital improvements for that segment are expected to cost $4 billion. Ouch!!! @JWH, yeah, for 4 billion, you could bye the Dallas Cowboys. Our country’s priorities are often messed up. @John532: I have an extremely hard time believing that it would only cost 4 Billion, especially after the issues California and Florida have had. I mean the Durham Chapel Hill light rail (and yes I know, all new infrastructure not just capital improvement) will cost 21 Billion. 4 seems low. $21 billion? What? It’s actually $3.3 billion. Now that number may go up, and you may well be right that $4 billion for the Raleigh-Richmond segment is low, but there are a lot of differences. First, the primary capital costs will be removing all the at-grade crossings and buying new trainsets. Plus, as anyone who has driven north on 85 knows, there’s very little between the Triangle and Richmond. Alamo Drafthouse Cinema is OPEN!! And it’s awesome! Going to be a huge catalyst for this side of the city! Having a Trohy Wife as I type!! ?? @Evan, Cool! I look forward to taking that same elevator ride. @ Steve: No idea where I got 21 Billion…. I think I saw 2.1 Billion and assumed government spending…. @Robert, no worries. Big, complex projects seem always go way over budget, especially when bureaucracies get involved. For what it’s worth, the Richmond-Raleigh segment of the train is going to start with a more direct line (the CSX “S” line) and that will cut like 40 mins off the ride. We could cut the time to DC pretty significantly with incremental improvements without one giant capital expenditure up front. Hopefully the NCRR (which subsidizes the Carolinian) will invest in modern trains some day. That alone would lower fuel costs and improve travel times. Transportation should bring us together. Bus stations should not repel, but apathy often allows bad design to make these spaces do just that. Raleigh has an opportunity to make this bus facility (and future others) welcoming and inclusive for everyone.